If you ever wanted to make authentic looking fake WhatsApp chats to fool your friends and family, you chose the right article to educate you. No matter what platform you use, here you will find tips to fake your chats easily. You will find by reading on that creating fake chats you can share as jpegs in Facebook or WhatsApp is actually really simple to do. With these snapshots of chats, you will find that they look identical to real WhatsApp conversations. You can change everything about them, though. Modifications include: changing the delivery status, setting whether the fake recipient is online, changing times of chat messages, choosing background images and switch quickly between sent/received messages. No matter your device, this process is simple on iOS or Android. 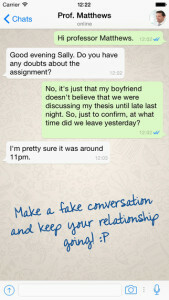 One of the best apps for creating fake WhatsApp chats that look authentic is Whatsfake. You can create a completely fictitious conversation with a slew of available options. You can customize: online status, profile pics, “is typing” notifications and more. Best of all, this is not exclusively a premium app. While there is a paid version, you can also find it  for free in the AppStore. The downside to the free version is the tag that says, “Created by Whatsfakeapp”, ruining the authenticity. For this reason alone, it is advisable to choose the pro version of the app. Below you can see what both available versions look like with their final results. It does not take long to generate these fake conversations with this app, which can have you pranking your friends in no time. Also, there are no limits to the amount of these fake chats you can make, so it can go on for a long, long time. Now, with the free version, everyone is going to immediately know that the creation is fake. The pro version genuinely looks like a chat screen, with no branding, which can really sell the prank. First and foremost, you have to download the application for yourself. Open it up and tap on the icon in the upper right corner of your screen to begin creating a new chat. You fill in the fields about the fake recipient. When you click save, you have a fake conversation that is ready to be shared with your friends at any time. For those that are Android users, you have several options to help you make fake chats for WhatsApp, though the best (and also free) app is  Yazzy. You can even branch out to create fake conversations over most of the popular services including: Facebook, iMessage, WhatsApp, Android SMS, and even Twitter. You fill in the appropriate fields, and upload pictures for a profile. You can then type out the fake chat and choose to save it. Now it is ready to be shared with your friends and family. You will find that all of these options are highly customizable and authentic looking. So many options o modify, including: navigation bar, custom WiFi icon, battery level, phone carrier, changing avatars, online status, backgrounds and much more. 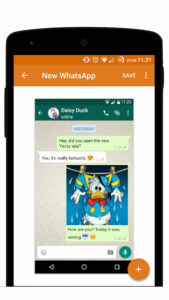 Once the app is downloaded, open it up and click on WhatsApp. Fill in all of the fields that you see to flesh out your fake recipient and text, and the chat will be created. To share it, you have to take a screenshot, as updates have not been yet released to share directly from the app to your friends. Will My Friends Know It Is Fake? You can be assured that with both Yazzy or the premium version of WhatsFake, your friends will be fooled by the authenticity of your creation until you tell them the truth. The only way they might figure it out is through typographical errors on your part, so be sure to double check yourself. Hopefully by now you are a professional with creating fake conversations, but if you are having any kind of trouble, feel free to reach out with the comment box below . How do u change date in time? ?